The bears are hanging in there, not about to go quietly. 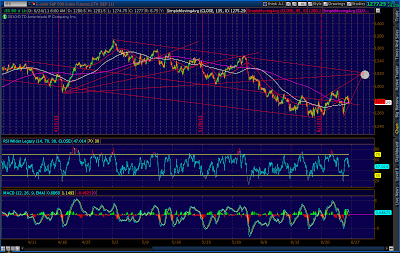 We’ve dipped below the 1272 target I had in mind, and did something interesting in the process. 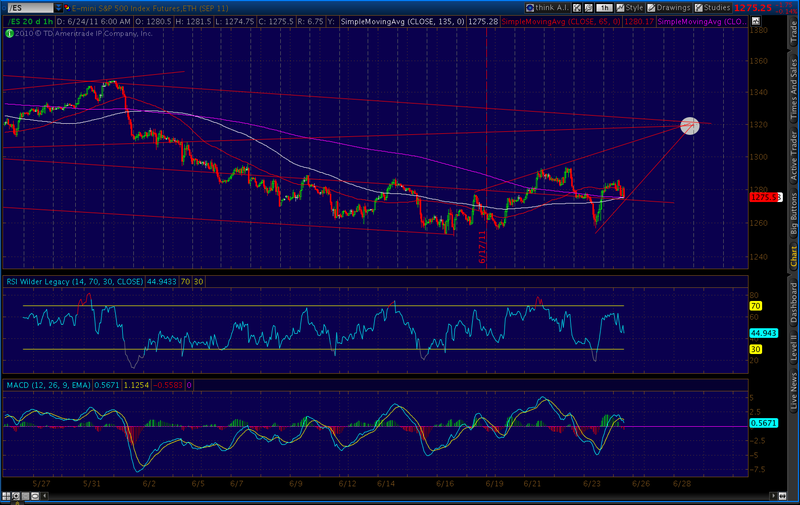 The rising wedge I drew this morning (bottom chart below) was a little too cute. 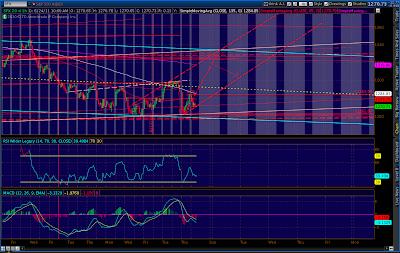 It led right to 1320. Since rising wedges almost never reach their apex, but fall out somewhere around the 66% (time) point, this troubled me. It meant I either had drawn it wrong, or we’d probably not reach 1320 anytime soon. The market just told me which. By recasting the wedge as a channel, the market has adjusted the upside from “40 points” to “unlimited.” If we can hold at these levels, and at least bump along the bottom of the channel, we should close somewhere between 1272 and 1275 on the day. Staying in the channel guarantees only 6 points per day (at this slope), so I expect a swing to the channel top either today or Monday. 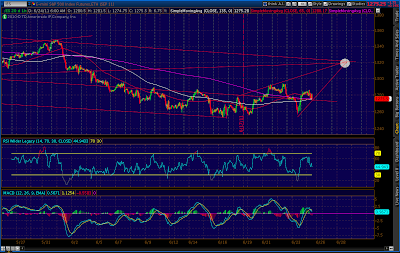 One caveat: the H&S; we just formed on the 5 minute chart. If it works, it has downside potential to 1258. 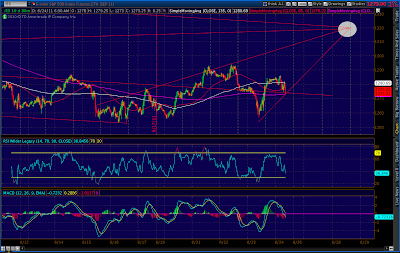 SPX just completed a little Gartley pattern on the 5 minute chart. Didn’t think it would fly, as the B didn’t quite make it to .618. 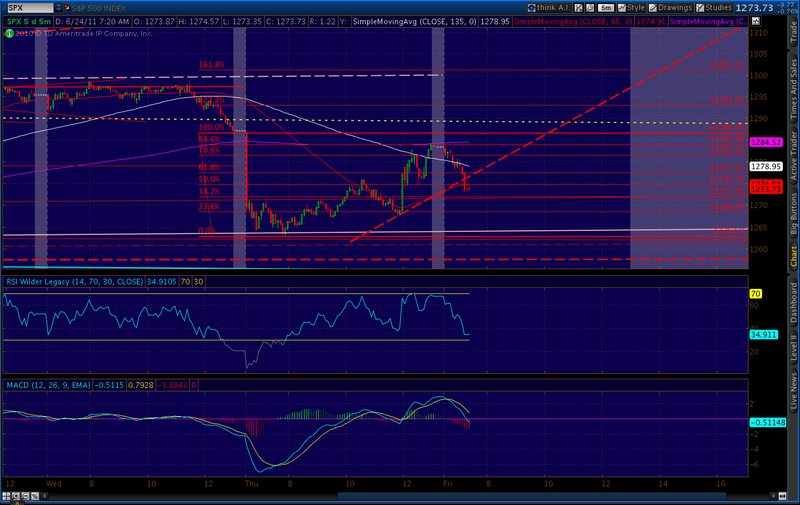 It might take us down to the .382 line at 1272 before we start up. 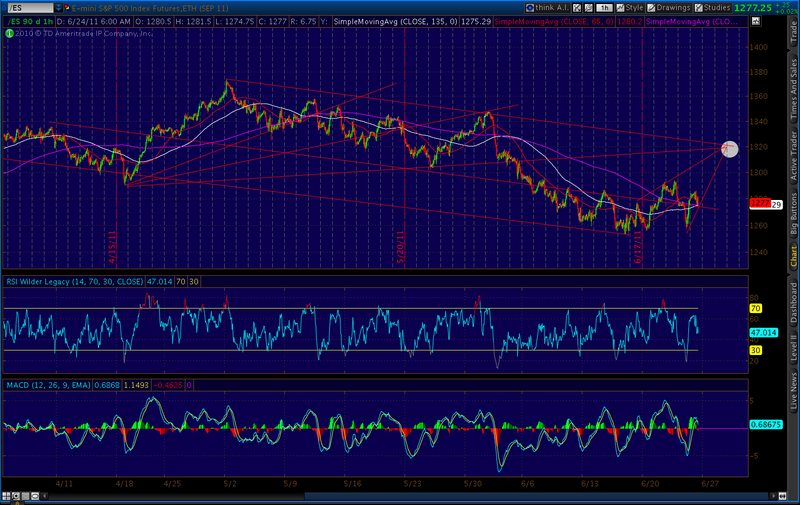 I’ve been watching the 5 minute chart intra-day, as it has an uncanny ability to forecast short-term turns on its RSI. A touch near 20 almost always marks a bottom, and 80 or above a top — though it can and does “overshoot” when the momentum is strong. R2K outperformance is bad news: Note that back in 2009, the RUT was up 3 points on the day of the rebalancing and down 20 the following Monday. Last year, it was higher by a point on the day of the rebalancing and off 33 points over the next four sessions. Accordingly, if the Russell 2000 is exhibiting some relative strength today, I will likely be selling some of my positions in this index at the close. Commods are the diff with 2007. They must bounce. But, of course, the real test comes at 12/11/07. I am long simply because of equity PCR. In other words March 11 is analogous to Aug 07, correct? Also, I notice that he's long-term bullish. I am decidedly not. Just checked his site. Good stuff, but notice that the 7/19-9/5 pattern was very similar to the 10/11-12/12 pattern. In the end, they both revert to the channel midline. The key differences are the strength of the interim highs (8/8 vs 11/1) and, of course, what happens after the return to the midline. I favor the latter time span because it follows two highs and two lows, all exceeding 1.5 std deviations. The earlier time span follows the first such low. This is indicative of an earlier phase of the pattern, as I found in looking at 10-12 other topping patterns over the past 80 years. My bigger concern, frankly, is whether we might: (a) fail to follow all those previous patterns; or, (b) expand into a much longer/larger pattern as happened in 1999. The 3/19 – 6/22 pattern was very similar to this, but was just the fractal tip of the 2000 iceberg. I don't think we will do either, but it bears watching. Any spike of normalized CPCE like this has led to rally. Seems like it was faster though. So Market Anthropology is still looking for his Aug 2007 washout with confidence. 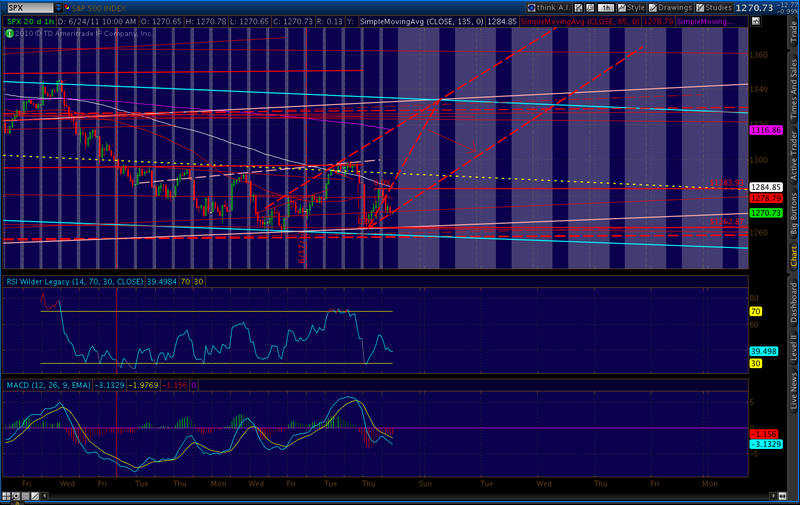 And, having a channel instead of a rising wedge would give us all the necessary room to zoom. 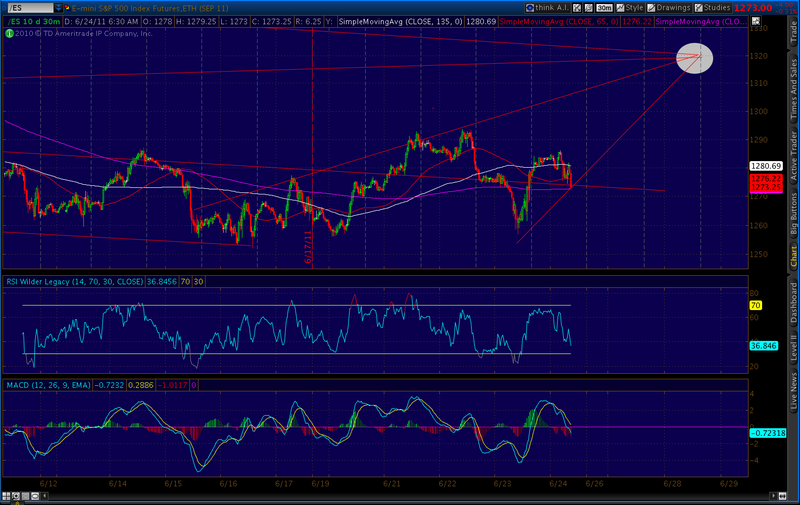 It's the perfect setup, when you think about it: heavy bearish sentiment, continuing ME worries, Greece still unsettled. Oversold markets love those big, fat walls of worry. Perhaps so. The market feels very headlines driven lately. Economic news, political news especially. I expect we'll need a trigger of some sort to jump start the rally. My guess is that Congress looks at what the market's telling them and approves a compromise on the debt ceiling over the weekend. While further dooming us all, it would probably give the market a boost. Still no buying on weakness of any kind. Just massive selling every day (see WSJ.com) selling on strength summary numbers.